Place shredded coconut in a dry small sauté pan over medium heat. Stir until golden brown, about 6 - 8 minutes. In a bowl, mix with lime zest; set aside. Preheat your grill to medium high. Spray each side of the sliced pineapple with cooking spray. Grill until there are grill marks, about 2 minutes on each side. 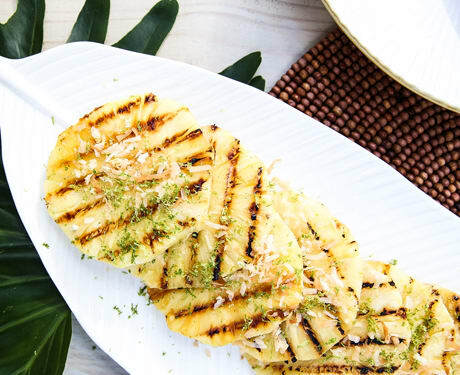 Evenly sprinkle the grilled pineapple slices with the chili powder and the toasted coconut lime zest mixture. Serve immediately. Muddle (or shake) strawberry, lemon juice, and simple syrup in a cocktail shaker. Add rye, 2 dashes bitters, and ice. 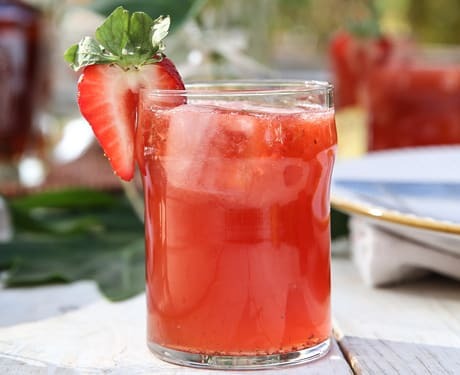 Top with ginger beer; garnish with a strawberry slice. In a medium saucepan, whisk sugar, water, and corn syrup. Bring to a boil and stop whisking. Boil vigorously for 5 - 10 minutes until the sugar reaches an amber color. Watch carefully. Remove the pan of sugar from the heat and let it sit for 2 minutes. Add in the cream and whisk to combine. Add the bourbon and stir to combine, whisking constantly until smooth. Remove caramel from heat and stir in the vanilla. Cool completely before transferring to jars or bottles. Warm to drizzle. 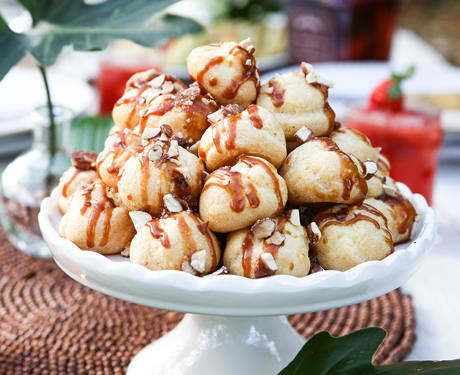 Place cream puffs on a sheet pan and drizzle caramel sauce over cream puffs and top with candied hazelnuts or almonds then transfer to a platter.